Getting a black zombie-fied copy of a creature from your graveyard every turn seems like a sort of consolation prize, but when you look into it a little more, it’s actually so much more than that. A lot of decks are used to creatures being unable to attack once they’re in the graveyard, and are not equipped to deal with even one extra attack per creature. On top of that, the token you get is not only a copy of all the creature’s abilities (hello, Mulldrifter and Hero of Bladehold), but unlike a lot of effects of this class, you don’t have to sacrifice it or exile it at the end of your turn. This card is a true gift from the God-Pharaoh to every type of player out there – it’s no wonder it turned out to be so good in tournament play. A card first hinted at by Gate to the Afterlife, God-Pharaoh’s Gift has seen a bunch of play in Standard. There are differences between God-Pharaoh’s Gift and The Scarab God, but the benefits are similar. Being able to maintain late game tempo being the leading reason among others. While The Scarab God slots you into black and blue, the advantage to God-Pharaoh’s Gift being an artifact is, of course, being able to run it in any deck. The obvious targets are anything with an ETB ability but there are a few cards that can become pretty busted at 4/4. It is expensive and although you can cheat it into plat with Gate to the Afterlife, you can get along just fine without the aforementioned card. God-Pharaoh’s Gift is an interesting card that proved to be a major force in Standard, even with costing 7 mana; being able to get extra value out of all of your deceased creatures is a potent effect that’s easy to abuse, as we see with The Scarab God. 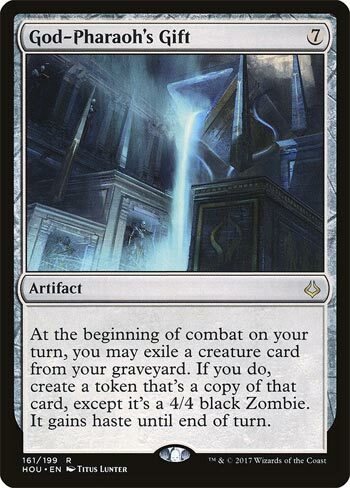 While this has synergy with Gate to the Afterlife, it can function in its absence, and a horde of Zombies is a good way to end the game. This is a great finisher in creature-heavy decks, and it can even help the cycling-based deck have good reach to end the game. It’s an expensive finisher, but it has immediate impact, and it keeps having impact.